Constant fliers know the pain of going around without getting any actual sleep. You may be sitting in a chair all the time, but the traveling part may be even more exhausting that walking around all day doing your job. Plus, there are those that can’t sleep if their life depended on it – so they’re stuck staring at the ceiling of a plane. These are the cases when you could pretty much kill for a cup of coffee. But when you are flying with one of the world’s top 44 airlines, what kind of coffee will you get? To cure your coffee anxiety, here’s a summary of what you can get to soothe that tired mind of yours, along with an infographic that will offer you a visual idea as well. Update (as on 6 Feb 2018): American Airlines no longer serves Java City and currently serves Freshbrew coffee (Freshbrew Group out of Houston, Texas roasts and packs American Airlines coffee under the Coffeehouse Roast label). If you’re planning to grab a coffee anywhere in the USA American Airlines, Java City™ coffee is the one that is going to be served to you. This coffee tastes smooth due to the slow roast, and it will give you that caffeinated kick that you need. Dennies, we serve Java City on our planes. Hope this helps! Have a great day. By flying with the Delta Airlines, you will have access to Starbucks Pike Place or VIA Ready Brew coffee. Delta Airlines and their connections serve coffee from Starbucks on more than 5,000 planes every day, which speaks of the way that this coffee is loved. Illy Premium Coffee combines the love for tasty coffee with the love of arts. Made from nine different Arabica coffee types, this coffee is not only aromatic but looks pretty as well. It’s no wonder that around 72,000,000 cups are served on the United Airlines. 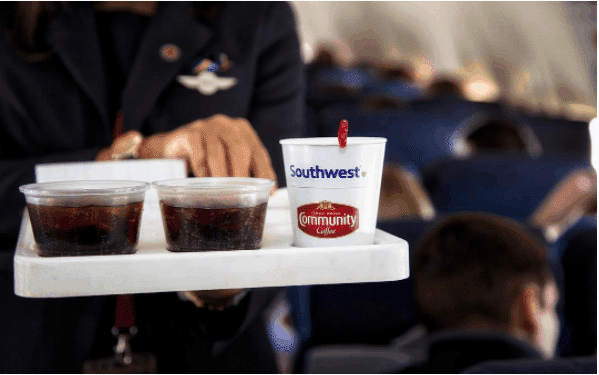 Not only is the Community coffee on the Southwest Airlines very tasty but for each served pound, the company makes donations to the ECOM Foundation – one that helps families grow our coffee in Mexico. There are two ways you can go with JetBlue Airways: Dunkin Donuts Decaf or Original Blend Coffee. The brand is America’s favorite when it comes to daily coffee, and it’s loved for the fact that it tastes like Starbucks, but slightly different. Hi Dennies! We serve Dunkin' Donuts® Decaf/Original Blend Coffee on our flights. Yum! Alaska Airlines serves Starbucks coffee onboard. Keep in mind that on board it’s just the Pike Place Roast or VIA Instant decaf, so if you want an extra shot of soy milk and vanilla, get it before you board. Spirit Airlines serves a tasty Brisk RCR Arabica coffee. The blend is rich, and it will definitely be an “omen of joy” for every passenger. On the Frontier Airlines, you get breakfast that looks like this: a snack and a cup of 100% Arabica coffee from Boyer. Isn’t that a great way to wake up after a long flight? Hawaii might make you think of tropical fruits and macadamia nuts, but what about getting some coffee during that flight? You can get a nice cup of Hawaiian Paradise Coffee that will literally bring paradise to your lips. British Airways have partnered with the Java Republic, and each passenger can now get a tasty cup of coffee, an Arabica mix that was roasted in Ireland. At Jet2 Airlines, it’s Starbucks all over again. You can receive a hot cup of VIA coffee, a rich Columbian mix, or you can go with a hot cocoa to settle your sweet tooth. Passengers flying with Flybe can grab a cup of Kenco Coffee, a carefully mixed blend that will immediately make you feel like home. Thomas Cook passengers will also get a cup of fully-flavored Kenco coffee that will knock their senses awake. Illy Coffee is a regular at Easy Jet as well, and it’s always served with a classic almond biscotti. You can go either for a regular or a decaf cup. Virgin Atlantic has made a contract with Fairtrade, and now they serve Fairtrade coffee on all their flights. The scent of organic coffee will be enough to rouse every passenger from their sleep. If you are a J-class on the A330 or 777, you will be able to receive a Nespresso on board. Other fliers will get a just-as-tasty Grinders. Qantas serves Vittoria Cinque Stelle on First class and Bodum on Business International. You may order a cafe latte, short black or flat white – as long as you are on the front end of the A380 and S330. Second Cup coffee is the one that provides the coffee for Air Canada. The coffee is fairly popular among the locals, which is why every flight will serve it. WestJet and McDonalds go hand in hand. Once on board, you can order a tasty McCafe that will keep you caffeinated until you land. We serve McDonald's coffee onboard. Passengers flying with Air Transat will be able to get a Brossard Instant Coffee. It’s quick, it’s tasty, and it also comes accompanied with a snack. People flying with Lufthansa will be able to enjoy a nice cup of Nespresso brewed from 100% Arabica coffee. If you are flying with Eurowings, you should be able to get a nice cup of Dallmayr Gold. The flavor is deep and rich, and it will be a good wake-up call for every passenger reaching their destination. Those flying with the Brussels Airlines will be able to get a cup of Rombouts to quench their caffeine thirst. It’s the locals’ favorite at every turn of the corner. If you’re flying with Air France, you will be able to get an espresso; all you’ll have to choose is the brand (Segrafredo and Illy) and the place (Business and La Premiere). Spanish people know how to bring the party to the airline, which is why they allow you to choose from both Illy and Nescafe Cappuccino. Both are popular brands there, and will surely give you a much-needed caffeine kick. As a regular or newcomer at Ryanair, you will be able to request a Lavazza coffee. The brand is known for its rich flavor, considering that it came from the Italians who are very serious about their coffee. 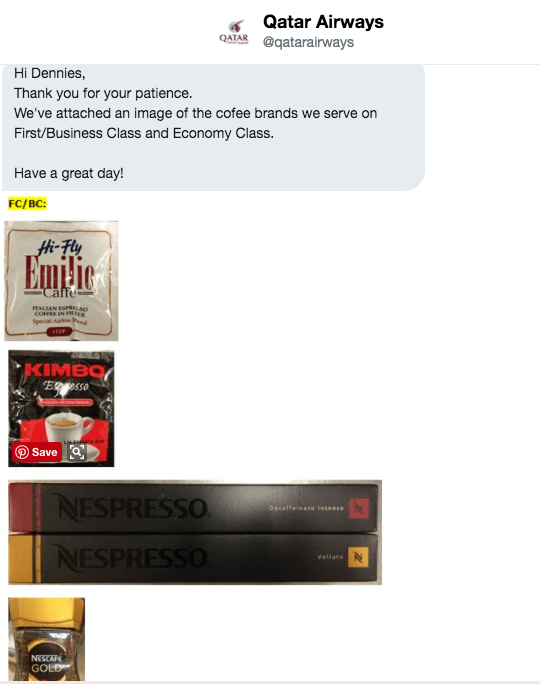 KLM serves on average about 18,550,000 cups of UTZ Certified coffee, which speaks for itself how serious they are about their caffeinated beverages. If you’re flying with the main Norwegian airway, you will have access to a very popular brand of coffee that is loved by tourists and locals alike: Nescafe. Its aroma is deep, and it will definitely play with your senses. As a flier with TAP Portugal, you’ll have access to Delta coffee. The company mixes Robusta and Arabica grounds so that the final flavor is a bittersweet aromatic experience. we inform you that the coffee served on our flights is Delta. When flying with the Swiss International Airlines, you will be able to receive either a Nespresso or a Blasercafé, both of which are very carefully prepared during the flight for every passenger. As a Business Class flier with Israel’s El Al, you will be able to enjoy a cup of Nespresso with every flight. You will have access to three different blending choices: the Ristretto, the Decaffeinato, and the Espresso Leggero. Each of them uses premium coffee grounds, so you’ll definitely enjoy them. If there’s anything we know about India, it’s that they take their coffee seriously – and that also includes the coffee received during flights. Their provider is Nescafe, and the coffee you will get is Nescafe Gold. It’s a popular choice, but one that never fails. The Emirates Airline serves Costa Coffee onboard. Regardless of the flight, you will be able to get a cup of coffee that was chosen because it’s so aromatic. Emirates Leisure Retail is a hugely successful franchise of this UK-based brand which boasts 2,000 stores worldwide. Update: Boncafe coffee is also served on Emirates Airlines. If you prefer FlyDubai over the Emirates, then you have two options depending on your class: Starbucks for economy and Nespresso for business class. With Starbucks, you can choose between medium-intense Columbian and the extra bold Italian, while with Nespresso you have the following three: Arpeggio, Decaffeinato, and Volluto. Don’t think that just because you landed in Asia, everything else will be Asian. Since Nescafe is popular among most tourists, that’s also what they serve during the flight. It’s classic, yet effective. Air China serves Golden Coffee, a richly flavored brew that you’ll pretty much find all over the world – including China. It’s their way of offering a luxurious-feeling flight for every passenger. Coffee lovers flying with the Japan Airlines will have the option of drinking coffee from the JAL Café Lines. The beverage service may be new, but locals love it, and it will definitely allow your flying experience to reach new heights. The name of the airport may mean “All Japanese,” but it was meant to be tourist-friendly. This is why Illy coffee is served during every flight, to give the tourists a sense of home. With Cathay Pacific, you only get coffee when you are flying with first class and business class. The brand of choice is, once more, Illy, since it’s so worldwide popular. With the Singapore Airlines, Illy is also the first choice. Incidentally, The Singapore Airlines was the first to serve Illy’s single-origin Monoarabica coffee to the passengers in Premium class. Glad to fly with you! RT @singaporeair: SIA is proud to introduce world-renowned illy coffee on board Suites, First Class & Business Class. Malaysian Airlines are more diverse when it comes to coffee. You can make your choice between Ethiopian Yirgacheffe, Brazilian Santos, and Nespresso Grands Crus. Each of them has a distinct, exotic aroma that every passenger will enjoy. Turkey is staying true to their culture, so fliers with the Turkish Airlines have the option of requesting a traditional Turkish coffee. This only applies, however, to the business class, but if you land such a ticket, then the aroma of the coffee will reach the skies. Coffee differs depending on the class you are flying with. For instance, the economy class will receive Nairobi Coffee, while business and first class will be able to make their choice between freshly brewed Kimbo, Hi Fly Emilio Caffe, Nescafe Gold, and Nespresso. If you tend to fly a lot, then nothing will compare to that black elixir of life that you can enjoy until you land. Sure, we would all love to sleep during our flights, but we don’t always have this luxury – so we can at least make ourselves feel better with a freshly brewed cup of coffee.